I may be slightly biased but I go once a year, every year and it has become a tradition for me to always stop in. The atmosphere is good, but it is more of a restaurant then a beer bar. Even so, the selection is great and joining the beer club really encourages drinking a wider variety or beers. The staff isn't extremely knowledgeable about the beer but they are friendly and willing to help as much as they can. They have descriptions of the beers organized by country but the descriptions could be a little more descriptive. This is a great place to try beers that may be harder to find elsewhere in a great atmosphere. With 27 taps and over 254 bottles, Zeke's has a massive lineup. While not having an extensive craft beer list, the import selections are outstanding. The menus is organized by coutry of origin, and numbered. I had an Anchor Steam on draft along with a Warsteiner Dunkel. My selections of bottles were Rodenbach Red (which was awesome) and a Eggenberg Urbock 23°. Its a very overwhelming list of beers, so it's definetly a place you want to visit frequently. The staff was very kind and helpful, though not too knowledgeable. The atmosphere is more of a restaraunt than a beer bar. And prices were very comparable to most other places for the selections. They ranged anywhere from $3.50-$17 for some 750ml's. All in all Zekes is a place to go just for the sheer amount they have to offer. I would have liked to seen more American Micro's, but with 254 Bottles to choose from, I guess I can't be too picky! My wife and I visited Lawton this weekend to go to Big T's and Old Hat, and then on the way back we swung by Dowagiac to go here, to Zeke's. Zeke's is owned by the same guy who owns Big T's, and its basically the same deal: they have roughly 250 beers and if you drink 130 of them (no time limit) you get your name on the wall. At Big T's its called Tommy Tetuski's challenge and here it's called Zeke's World Tour of Beers. And its a good world tour. I tried my first Berliner Weiss (with and without syrup) and my wife had some Delerium Tremens. Lots of beers available, obviously, but we'd been drinking all day so we didn't have a lot. You order your beers by number, which i think is pretty cool, especially since its an innovative way to get people to try different things (don't worry, theres a big sheet with all the beers and their corresponding numbers). One of the best moments was when a guy came in and asked to have some empties because he had just brewed his first homebrew and needed some clean bottle. They brought out an emormous crate of bottles and he took what he wanted. I wanted to talk homebrewing with him but i didnt want to leave my wife just sitting at the bar. Really, if you live near Dowagiac or are travelling anywhere near it, this is a must-visit place. I've been through Dowagiac about 30 times over the past few years and never even knew it existed until 2 weeks ago. Check it out if you can. Edit: we went here again this past weekend and i made more of a note of some of the beers. First of all, I had a '04 Thomas Hardy's and it was friggin' excellent. Also have Samichlaus (and two others from the Eggenberg brewery), Ayinger, Speakeasy (from San Fran), Celebrator, Sammy Smith, He'Brew, St. Peter's, Greene King, Weihenstephan, Traquair, Okocim, Sinybrichoff, Lindeman's, HAcker Pshorr, Aventinus, Pinkus, Chimay, Duvel, Don-de-Dieu, Unibroue, St. Louis, and many, many more. It's a nice list, and, again, impressive considering its not in a very big town. 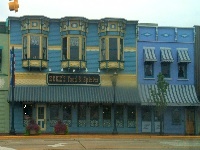 Zeke's is a must stop for anyone in the Southwest Michigan area. Over 30 different micros are currently available, mostly from the Great Lakes area. 33 countries are currently represented with England(30+), Germany(50+), USA, & Belgium(20+) as the dominant brews. This is the place I credit with getting me to try many different beers. Since I started going there 8 or 9 years ago I have always made a point to try 2 or 3 beers I wouldn't "normally" drink. Unfortunately, I only made it there 3 times a year or so. The good thing is that these are now the beers I normally drink. Good food--Good service--Nice atmosphere & a Great beer menu. Don't miss it!